GPDeluxe offers you an exclusive booking service connecting you with the many party venues that explode into life for the most glamorous race weekend of the year. Please contact us to reserve your space - don't miss the party! Monaco was the birthplace of the Amber Lounge where the magic all began. 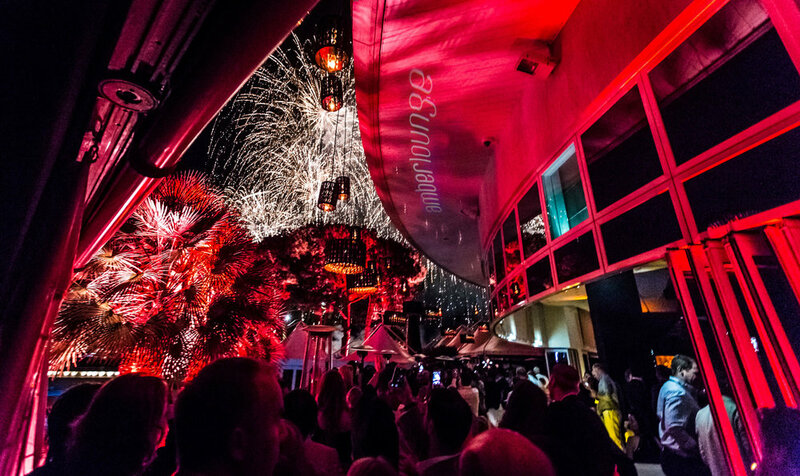 No other destination captures the glitz, the glamour and the grace of Formula 1 quite like Monaco - ad no club captures the excitement quite like the Amber Lounge. A breath-taking street race, the glorious azure backdrop, the most thrilling entertainment imaginable, welcome to a weekend like no other! Over three nights in May royalty mingles with Hollywood stars and sporting heroes. Iconic artists perform exclusive live performances. The extravaganza kicks off on the Friday night with the eagerly anticipated U*NITE Charity Fashion Show swiftly followed by parties on both the Saturday and Sunday nights. Simply THE best tables in the house with dance floor position. Tables receive unrivalled service as well as a three course dinner, followed by 6L Methusalem bottles of Champagne and 3L Jeroboam bottles of premium Vodka throughout the whole night. A personal table waitress and a private pavilion on the terrace to complete your unforgettable F1 party experience. Reserved seating on a shared table in Dining followed by the club which includes unlimited bottle service throughout the whole night. Dubbed as Monte-Carlo’s temple of clubbing, Jimmy’z is home to some of the greatest Formula 1 Grand Prix after-parties. The best DJs, the best booze, and the best view of the Mediterranean: it’s no wonder why this legendary nightclub attracts VIPs and Hollywood A-Listers all year round. Fancy a VVIP treatment? Check in to the exclusive Boom Boom Room in Jimmy’z, specially decked out by acclaimed fashion designer Philipp Plein in his signature rock-n-roll grunge style. Located in a former concert hall from the early 20th century, the Buddha Bar successfully combines a historic architectural heritage with a decor inspired by the Orient. Restored and regilded with pilasters and cornices beneath a 7-metre high ceiling, the Buddha Bar has a majestic feel to it. Yet under the gaze of the traditional giant Buddha, specially made in Asia, this subtle combination provides a setting of incomparable charm. Lounge and world music, enhanced by electro riffs and tribal rhythms, mixed by the resident DJ PAPA is a key element of the Buddha Bar experience. An acknowledged reference for over ten years, the Buddha Bar has succeeded in establishing its musical trademark all over the world. Dining at the Buddha Bar is an experience guaranteed to be full of surprises. Those who expect to be served traditional Chinese food will be delighted by the wide range of innovative, appetising and tasty dishes, specially prepared in our kitchens. The Lounge Bar on the ground floor extends onto two open-air terraces either side of the entrance to the restaurant, so guests can enjoy the balmy early summer evenings. The bar is also an ideal place to relax in before dinner or after work. Sashimi, maki, sushi and other Asian specialities are an ideal accompaniment to one of many creative cocktails or sakés – well worth discovering.